One of the things Harvard is most famous for – largely through it’s own bragging – is the so-called “sixth course”, in which the caliber and/or celebrity status of the people who come here to give lectures and participate in panels is generally higher than other universities. On my first weekend here, The Kennedy School hosted this gentleman. The talk was fairly decent and you can read about it here and here. 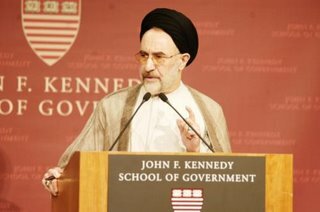 Khatami used diplomatic language and didn’t name anybody – not even Osama bin Laden – but he didn’t hold his punches either. Not inspirational nor full of energy but at least engaging. Idiot. Like any half-way decent public figure from the East, Khatami answered in indirect ways while making it clear he wasn’t dignifying the question. The student walked away shaking his head and muttering, “He didn’t answer me.” Similarly, most of the other questions asked by undergraduates – largely the quickest to the microphones scattered around the Forum – were in this vein: strident, immature, rude. Khatami danced around these questions with dignity but other people around me grew frustrated at his lack of directness. As I return to America, this reminded me again of how this level of frankness and antagonistic debating style is such a quintessential part of the American way but so alien to other countries and cultures. I’m a fan of this characteristic of Americanism but was annoyed that the Americans around me – in the nation’s most elite of educational institutions – don’t realize how rare this quality is in most other parts of the world, particularly the East. Which all added up to a terribly lost opportunity to ask an insider any actually challenging questions about current policies and potential ways forward from the current US-Iran impasse.